The lake is just barely under three miles long and is about one mile wide. Easy, out and back paddle. Could be made more challenging if longer distances are desired. I wouldn't recommend doing the whole lake unless the paddle is very experienced and knows how to read constantly changing weather patterns in the Sierra. Paddlers usually spend anywhere from one to five hours out on the water. The road to the lake is not accessible November through April. The peak of summer vacation season the lake is very busy. Weekdays in the summer or weekends during the shoulder season are the best times to visit. Dogs are allowed but must be kept in voice control or on leash at all times. Parking is free in designated day use areas. Fallen Leaf Lake is a glacier-formed lake located about a mile from Lake Tahoe. 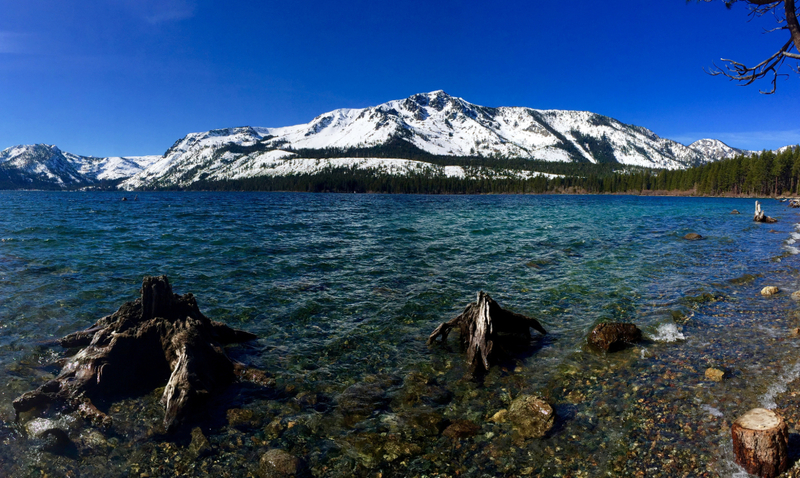 The three-mile long and one-mile wide alpine lake boasts terrific views of Sierra Nevada granite peaks and crystal clear waters. It’s a great spot to launch your stand up paddleboard or kayak on a clear summer day to experience the beauty of California mountains. The area is well known for its friendly locals and wildlife sightings. 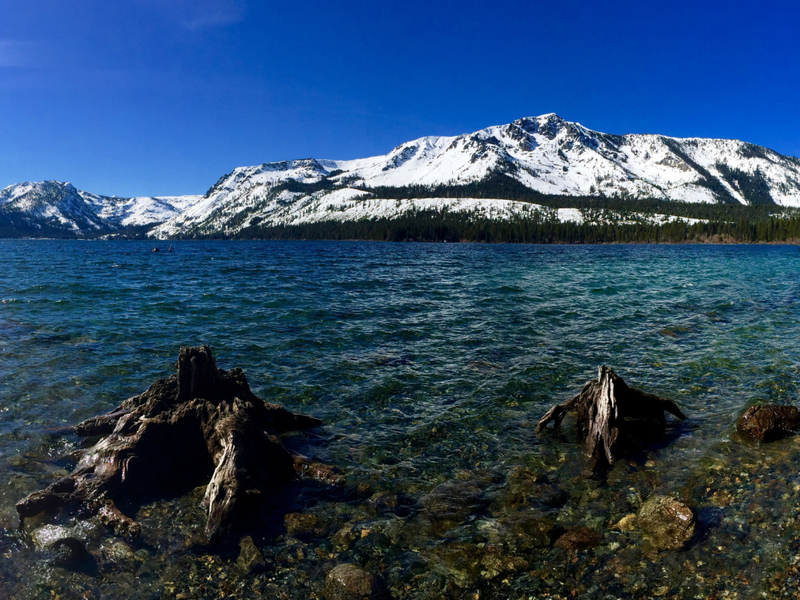 Surrounded by the beautiful El Dorado National Forest, Fallen Leaf lake features gorgeous peaks that seem to rise straight up from the lake’s shore. Your paddle around the lake will take you right along its rugged shore, which is comprised mostly of granite boulders and thick shrubbery. A popular vacation destination, it also features large and luxurious cabins along the lakefront. Paddling will allow you to take in up close and exclusive views of some of the most gorgeous homes in the area. Visiting Fallen Leaf is like stepping back in time. The people are friendly and the local convenience store is quaint. Don’t be put off by the narrow, winding roads that take you there. Think of them as a portal into a slower, easier going state of mind as you head to to the southern shore to launch your craft at the Marina. During popular times to visit, the lake gets a little congested with all the traffic, so pay attention to who has the right of way and hug the shoreline in your human powered crafts. If you are able to visit on weekdays or during the shoulder seasons, you will be rewarded with a peaceful and calmer experience of Fallen Leaf Lake. If you are looking to get off the beaten path and experience something a little different than the typical Tahoe vacation, this is the place for you. Experienced and new paddlers can both enjoy Fallen Leaf Lake in kayaks or canoes or on SUP boards. Dress in layers because weather in the Sierra is unpredictable. Taking a brisk pace as you paddle will allow you to see more of the lake and get a good workout, whereas taking your time and meandering along the rocks and shoreline is equally rewarding and enjoyable along this beautiful lake. From Highway 89, which runs from Tahoe City to South Lake Tahoe along the western shore of Lake Tahoe, turn Southwest on Fallen Leaf Road. Traffic moves slowly on this narrow road, so relax and enjoy the scenery as you drive. It is also closed November through April. All crafts must be washed before launching into Fallen Leaf Lake to prevent the introduction of invasive species. Marina staff will wash and inspect all hand launched craft for $5.